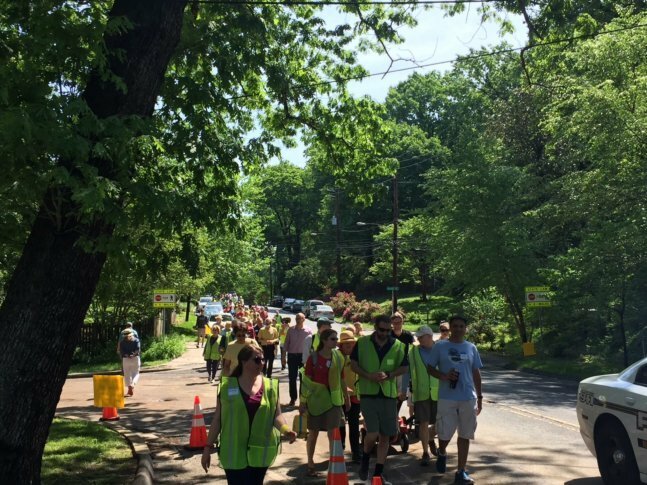 About 100 Silver Spring residents took to the streets Sunday for a safety walk with the aim of making the 1-mile stretch of Dale Drive between Colesville Road and Georgia Avenue a little bit safer for neighborhood residents. SILVER SPRING, Md. — It’s a universal complaint in residential areas — people hate how fast and how frequently cars speed by their homes. But one neighborhood in Montgomery County has found what even their local county councilman calls an “unusually effective” way to bring about change. On an average day, about 4,000 cars use a 1-mile stretch of Dale Drive between U.S. Route 29/Colesville Road and Georgia Avenue in Silver Spring. But if there’s anything tying up traffic even more so than usual on either one of those roads, that number goes way up. While all those cars are zooming by, at speeds that usually exceed the 30 mph speed limit, residents who live here don’t have any sidewalks to walk on and only a few crosswalks to rely on. In fact, those sidewalks are usually to blame for accidents because when one car stops for a pedestrian, someone driving behind doesn’t always stop in time. Such an accident happened only a few minutes before a safety walk that was organized by residents who live along and around this stretch of Dale Drive. Hart says it was a walk around the neighborhood while pushing a stroller that first alarmed her, and after talking to her neighbors she realized there were 20 years of complaints that had gone pretty much ignored. So she organized her neighbors and started pushing both the county bureaucracy and the elected leaders at the county and state level, and that’s already led to some noticeable changes in the neighborhood. Among the changes is the “construction of pedestrian islands in three of the (seven) crosswalks, short medians to narrow the roads in some of the areas where the lanes are really wide (and) new signs,” says Hart. The county is also studying bigger, more permanent changes, which could include a path for pedestrians and cyclists. It might convince Julie Ipe, who lives on Dale Drive across Route 29 to walk the straight shot more often. She did it once before, “and I said ‘never again,’” said Ipe. He says the residents along Dale Drive have outlined the most effective way to bring about change in neighborhoods.